Looking for a fun Father’s Day gift? 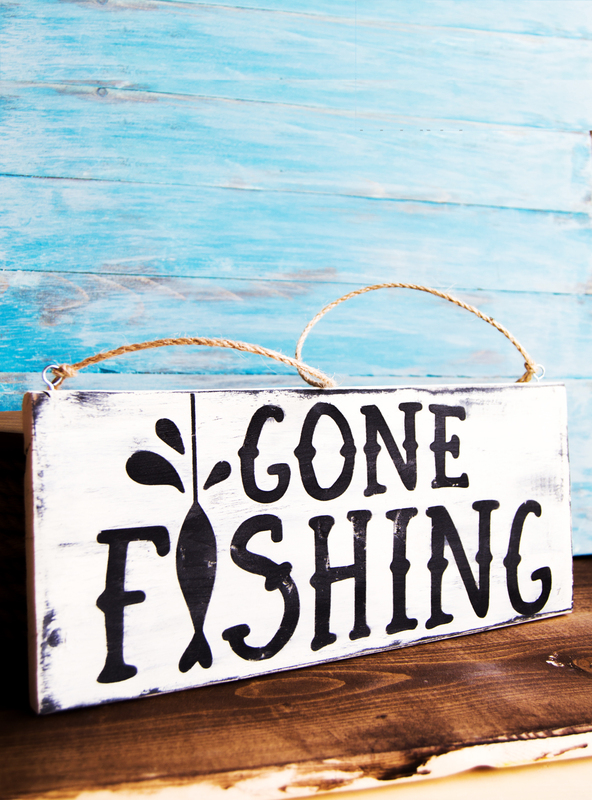 This gone fishing sign is perfect for an office or man cave. 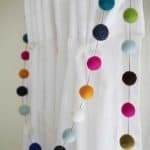 It’s a very simple DIY project and you only need basic crafting skills to make it. The man in your life is going to love this sign! Still looking for a fun Father’s Day gift? 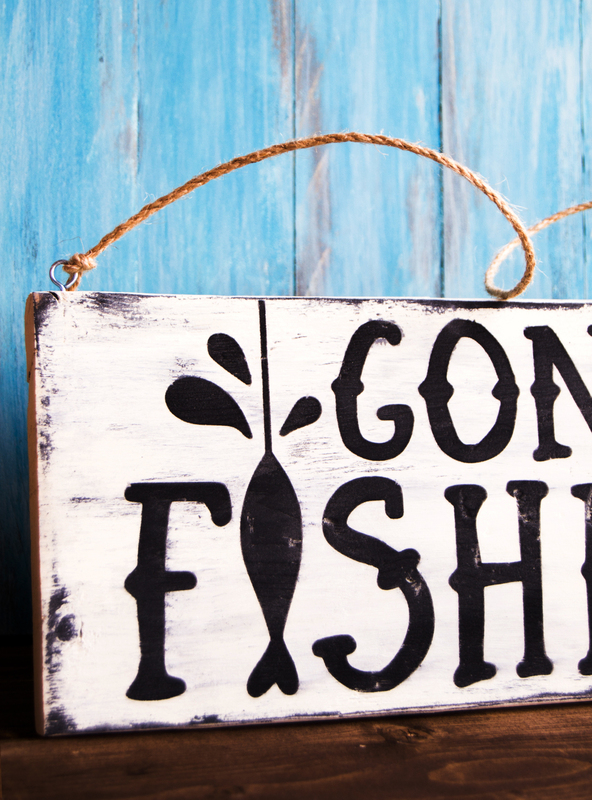 This gone fishing wood sign is perfect for your dad if he loves fishing. My dad doesn’t but my uncle does – and I’m pretty sure he would love this! 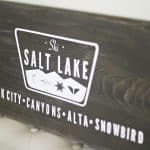 This wood sign is a breeze to make if you have a die-cutter but you can totally create it even if you don’t have one. My wood was actually a leftover for a shelf project I was doing not too long ago – it was a 1″ x 5″ x 8′ rough pine board bought at my local hardware store for $3.50. 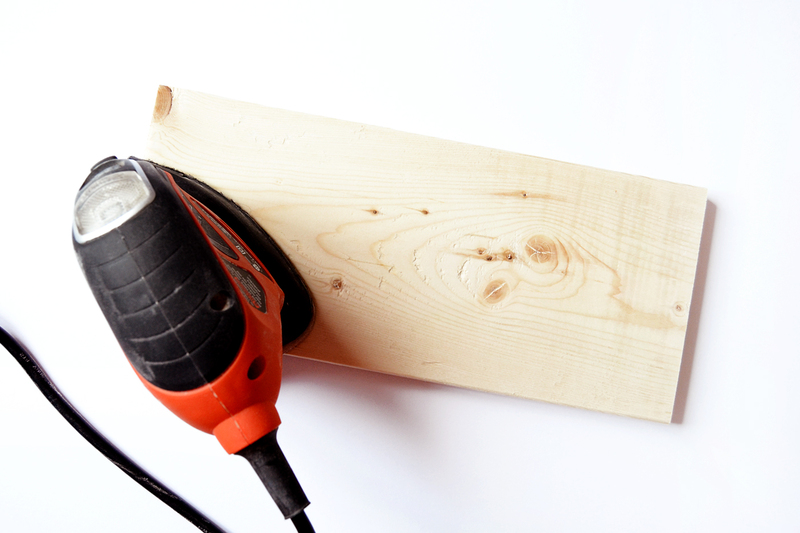 If you are purchasing wood, you can have them cut it down to size for you. 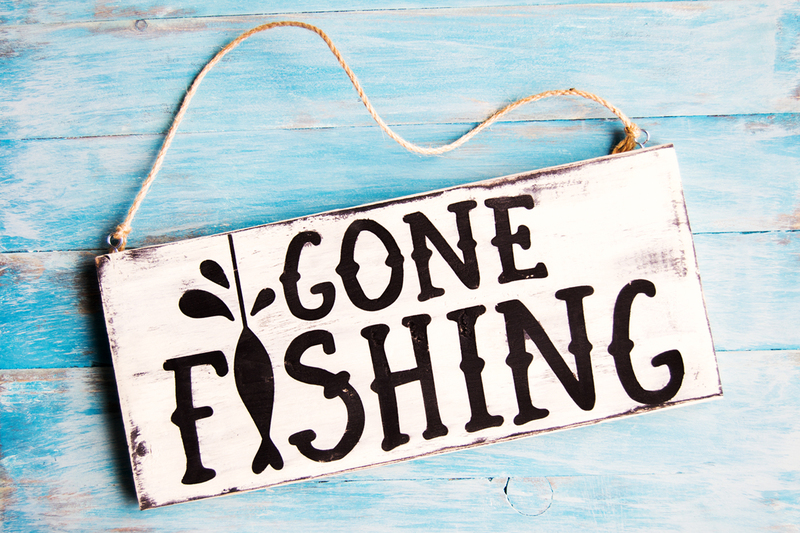 My gone fishing wood sign ended up measuring 1″ x 5″ 12″ – so in actuality, if you are purchasing a pine board for this, one board would give you enough for 8 signs! 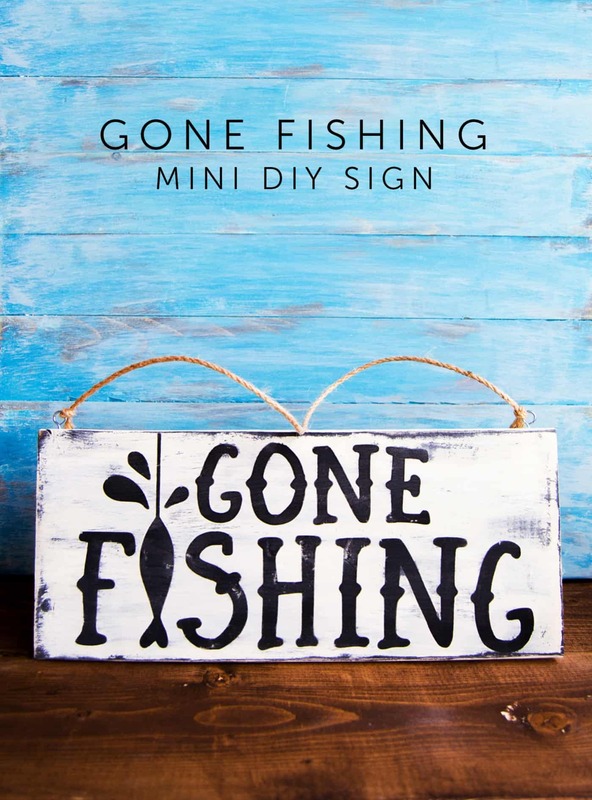 Never fear, you can still make this gone fishing sign! Your first option is to purchase some vinyl (you won’t need the transfer tape) in a sheet size to cover your wood. Use our free printable (link in the supplies section) to cut out the design with a craft knife. 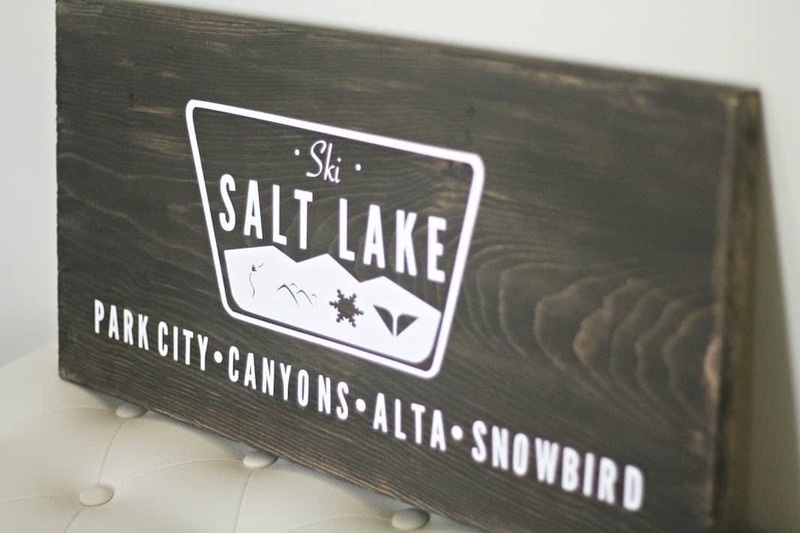 The design isn’t too complicated and the sign is distressed, so the project is pretty forgiving. 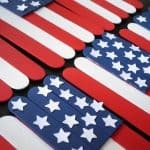 Your second option is to purchase adhesive letters in the design of your choice from the craft store. They obviously won’t be in the same design, but if you see a font you like better than what we’re offering, it’s a good substitute. 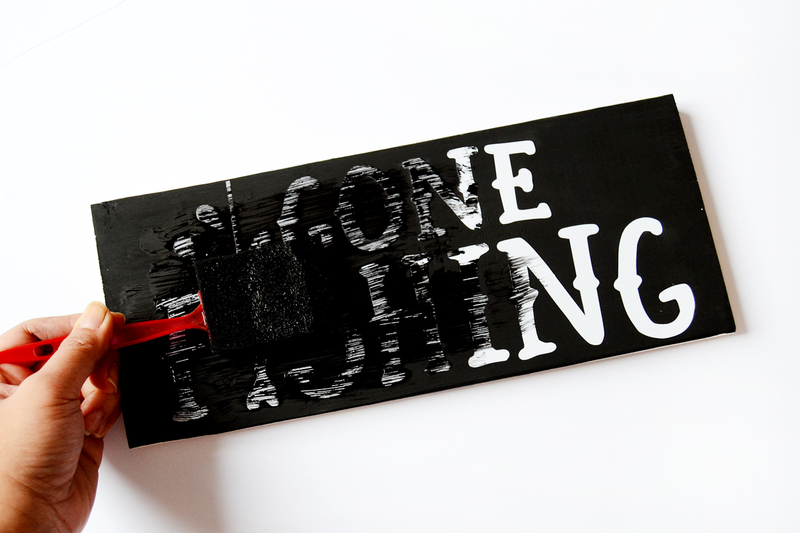 The third option for your gone fishing wood sign is to get custom vinyl lettering on Etsy. You can purchase letters in a font you like or even get someone to cut out this design using their Silhouette and send it to you. Basically, you’ve got some good options! 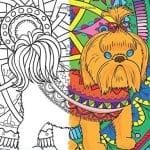 Now check out the tutorial for this easy painted project. Step 1. Cut and sand your wood. Have your local hardware store cut it for you or cut it yourself with a saw. If you purchased the nicer pine, you wouldn’t need to sand as much. I purchased the cheaper pine so I broke out my trusty mouse sander to help with the sanding. Wipe it down with a clean damp cloth afterwards. Step 2. Paint your wood the color you want your letters to be. I just use a simple foam brush for this, nothing special! About two coats should do it. Let it dry. Step 3. 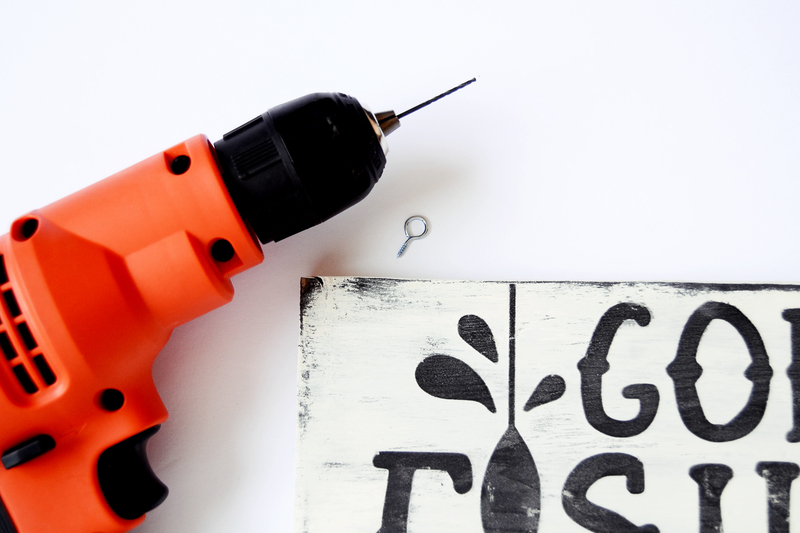 Cut your template and apply it onto the wood. 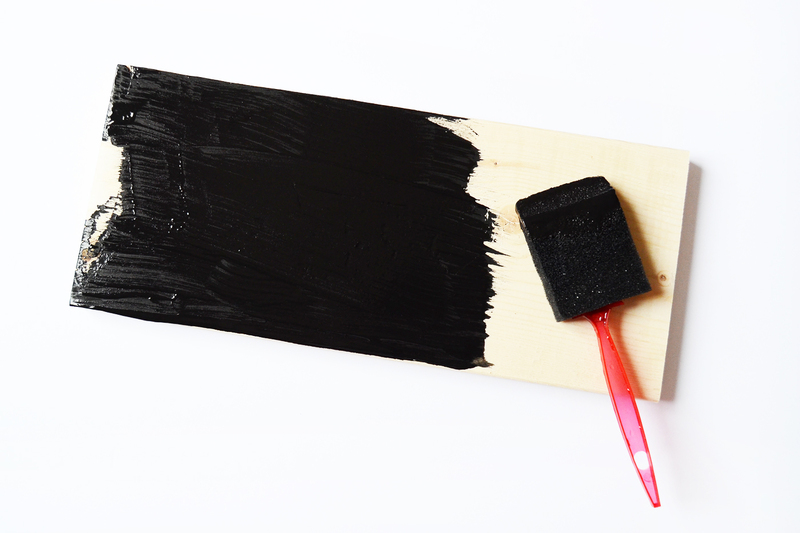 You want the paint to be really dry before you do this, or you’ll risk not having your stencil adhere onto the wood properly. I cut my stencil out of vinyl for this project. 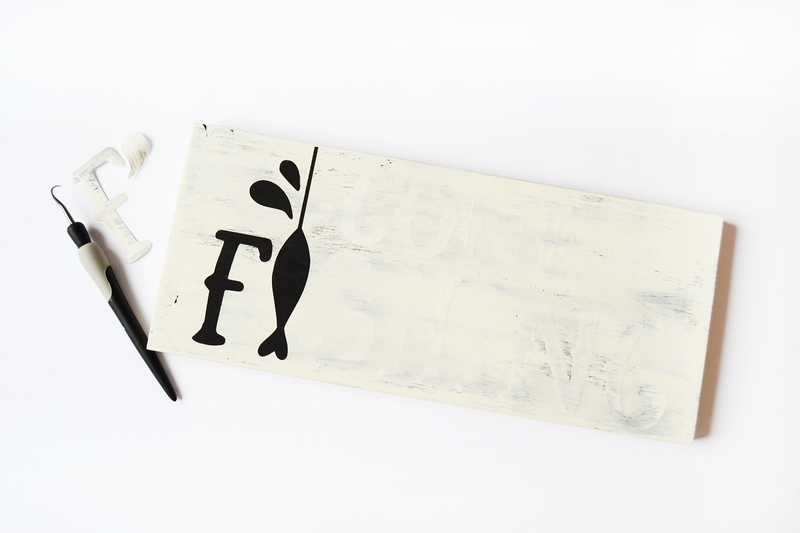 Use a scraper to make sure your stencil is adhered properly. Remove the transfer. Step 4. Roughly go over the letters with your base paint – we do this to seal the edges and prevent too much bleeding from the top paint coat. Step 5. Paint your top color – I used a warm white to give a nice, old feel to it. I also used petroleum jelly on the edges and some of the surface to give my DIY sign a more distressed look later. 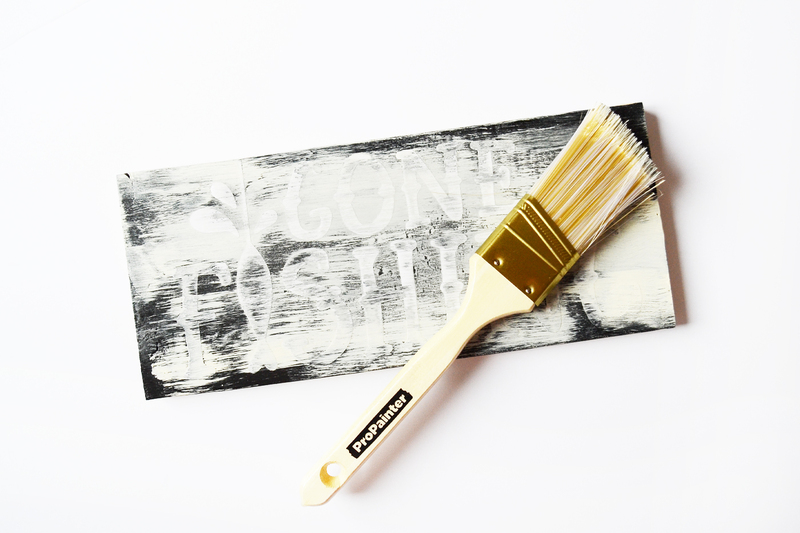 Use a dry brush for the top paint to give a streaky, unfinished feel. Paint the sides and the backside as well. Step 6. 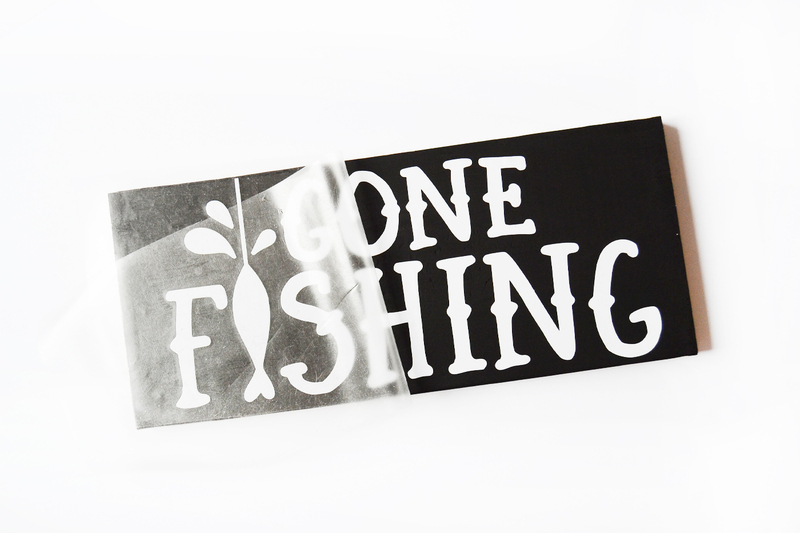 Remove the sticker stencils from your gone fishing sign once the paint is dry. Step 7. Sand to distress – again, I used my trusty palm sander for this – it just makes everything so easy. You can also use sandpaper though it may take a bit longer to give you the results you are looking for. You can also opt to not distress the sign! Coat your sign with polycrylic (once dry) to protect and seal it, specially if you are hanging it outside. Step 8. 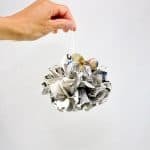 Attach hooks on top by first drilling it with a 1/16″ drill bit so that it will be easier for you to screw your picture hanging hooks in. Step 9. 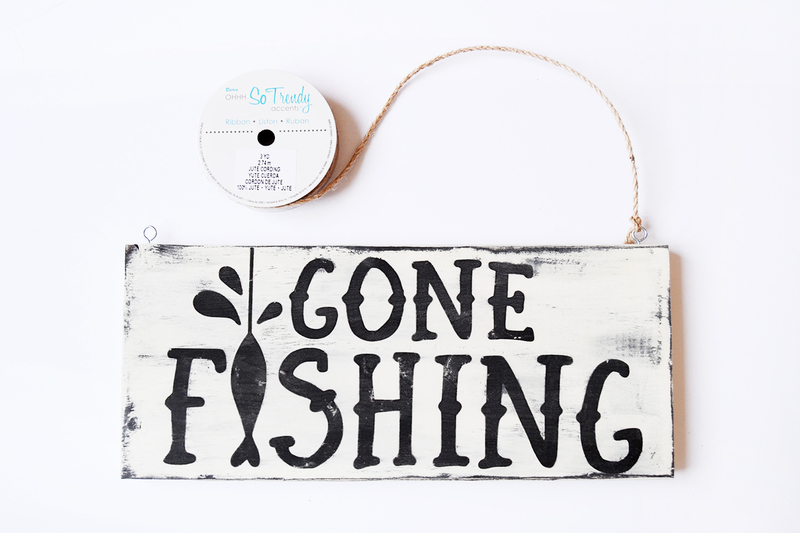 Finish your gone fishing sign with jute twine for a rustic feel. And you are done! 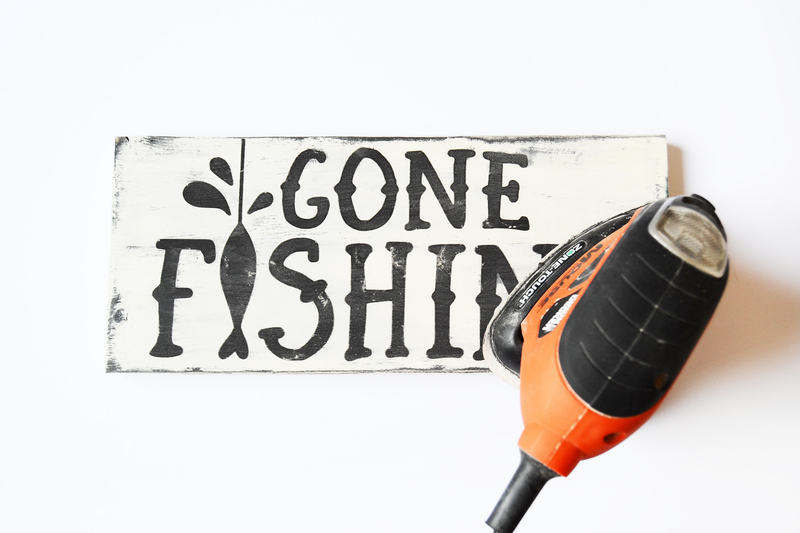 This gone fishing wood sign is an easy and thoughtful Father’s Day gift for any dad who loves to fish. I hope you enjoyed this tutorial and don’t forget to visit my blog for more tutorials and freebies like this! Happy crafting, folks!